Click the button below to add the CarboPro Green Balance - Mito Power - Best by Date 12/2018 to your wish list. Get Your Daily Dose of SUPER GREEN Foods easily with just 15 grams of Nutrient Dense GREEN BALANCE Mito Power. It has more than 55 whole food sourced alkalinizing natural and organic ingredients. It has billions of probiotics. It contains Phytonutrients, Bioavailable Natural Vitamins and Minerals, Anti-oxidants (high ORAC value) and digestive enzymes for optimal nutrient absorption and helps your body maintain its natural pH balance. It is clinically formulated with each ingredient's Optimal Nutritional Value. Use ONE or TWO scoops (15 to 30 grams) daily to provide optimal restorative support for all your body's systems, to train and compete at your best. 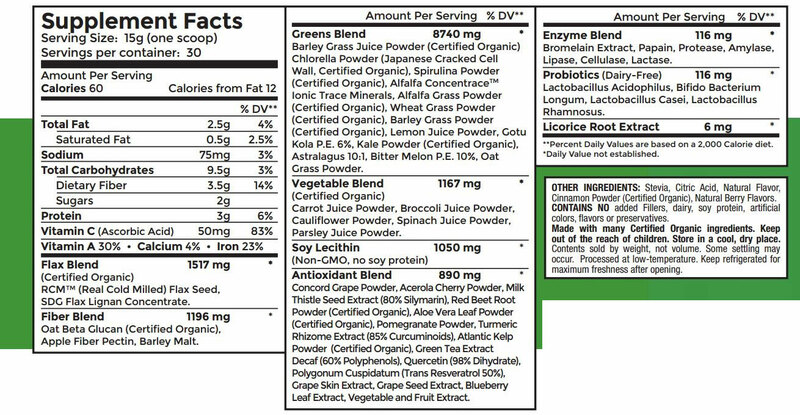 GREEN BALANCE mixes and blends easily and tastes great. Nutrient dense – natural organic ingredients. Probiotics and live enzymes to optimize digestion and absorption. Alkalinizing superfoods for ph balance. For recovery through optimal restorative support for all body's systems. Mixes and blends easily and tastes great. Green Balance Alkalizing Blend™ is a synergistic "green" formula of concentrated alkaline superfoods. A valuable source of naturally occurring phytonutrients, chlorophyll, live enzymes and bioavailable vitamins and minerals, Green Balance Alkalizing Blend™ aims to help boost energy and stamina, assist with mineral replenishment and provide optimal support for the body's systems. With excellent solubility and a refreshing, healthy green taste, Green Balance Alkalizing Blend™ adds a nutritious and flavorful boost to smoothies. Green Balance Alkalizing Blend™ is a 100% Superfood supplement with no fillers or additives. I ordered one just to try, and liked it so much I've ordered more and it is now a part of my regular supplements. Highly recommended!